"Skyfall," Daniel Craig's thrilling third outing as British secret agent James Bond, is so impressively on-target it ranks as the best installment of the 50-year, 23-film franchise. Mixing high-energy action, a sense of respect for the hero's history and even some unexpected heart, this not only is a great 007 adventure but a great film, period. New Bond director Sam Mendes ("Revolutionary Road," "American Beauty") yanks the series firmly back on track after 2008's disappointing "Quantum of Solace," which failed to live up to the high standard set by 2006's terrific "Casino Royale" reboot. Like that first Craig-starring 007 blockbuster, "Skyfall" gets nearly everything right: intricately choreographed action, a globe-spanning plot and a more gritty portrayal of its licensed-to-kill protagonist. "Skyfall" also is visually stunning, with gorgeously picturesque locations from Istanbul to Shanghai to the Scottish Highlands. The frantic car, motorcycle and train chase that opens the film is both incredibly scenic and flawlessly assembled, unlike the incomprehensibly edited action sequences in "Quantum of Solace." A neon-lit nighttime pursuit in a glass skyscraper is dazzlingly stylish, wall-size computer graphics at MI6 headquarters are high-tech futuristic and the devastated island of deserted buildings that serves as the villain's lair is like something from "Inception"'s deepest dream level. 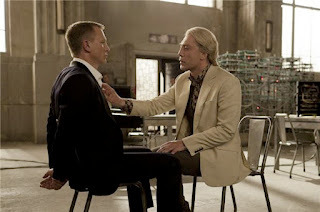 Dyed-blond Javier Bardem is just over-the-top enough as bigger-than-life bad guy Raoul Silva, a taunting cyber-terrorist with an inside connection to 007's spymaster boss M (a no-nonsense and steely Judi Dench). Silva has been twisted into a vengeance-seeking and frighteningly resourceful anti-Bond after what he regards as an unforgivable betrayal. His metaphorical monologue about how to rid an island of rats is an insidiously chilling tour de force, and his almost playful psychosis is Joker-level creepy. Bond has his own reasons for resenting M's coldly professional ruthlessness this time around, even while acknowledging its necessity. 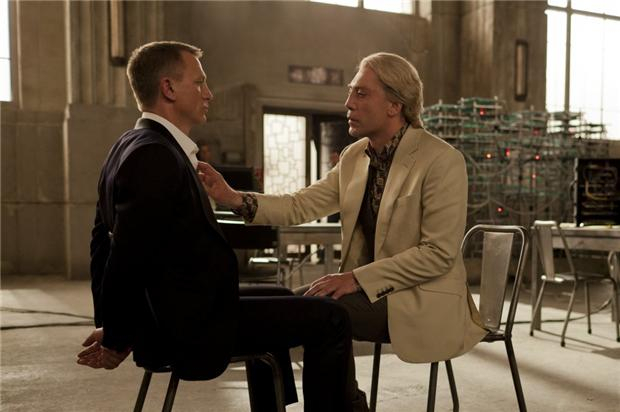 That conflict gives "Skyfall" unexpected emotional weight and real character depth, as Bond confronts issues relating to his own expendability, potential inadequacy and possible obsolescence. The screenplay does such a good job of blending retro, rebooted and remixed classic Bond elements it will delight longtime fans while effortlessly seducing the uninitiated. Neal Purvis and Robert Wade, who wrote "Casino Royale" and "Quantum of Solace" with Paul Haggis, 1999's "The World Is Not Enough" with Bruce Feirstein and 2002's "Die Another Day" on their own, are joined this time by Bond newcomer John Logan ("Hugo," "Rango," "Gladiator"). Logan's contribution apparently was significant enough that he has been signed to script the next two Bond movies himself. Without revealing spoiler specifics, one plot development in the movie qualifies as genuinely shocking, and new bits about Bond's background lend him some darkly tragic depth. On the lighter side, Ben Whishaw is wonderfully deadpan as the youthful and coolly nerdish technology and weapons expert known as Q. When Bond is underwhelmed by the equipment he receives from Q this time around, Q drily remarks, "You were expecting an exploding pen? We don't go in for that anymore." Ralph Fiennes appears as an icy British government higher-up who informs M that her days are numbered. Albert Finney is a figure from Bond's past who provides a glimpse into his tortured soul and walled-off humanity. "Skyfall"'s Bond girls include Naomie Harris as fellow MI6 field agent Eve and Bérénice Marlohe as glamorously gorgeous damsel in distress Severine. But the most prominent female this time around is none other than Dench's amazing M, who proves she is much more than a mere bureaucrat when she's forced to deal with the biggest mistake of her career. One line in the movie seems out of place, when Bond makes an inappropriately dismissive remark after an untimely death. But when only a single flaw merits mentioning in a 142-minute movie (the second-longest Bond film ever, at only two minutes shorter than "Casino Royale"), it's easy to overlook. "Skyfall" is the first 007 movie directed by an Oscar winner, and Mendes does a breathtaking job. Rumors that Christopher Nolan might helm a future Bond film have had fans salivating for years, but seeing the sensational "Skyfall" brings another intriguing matchup to mind. Wouldn't it be great to see what Mendes could do with Batman?